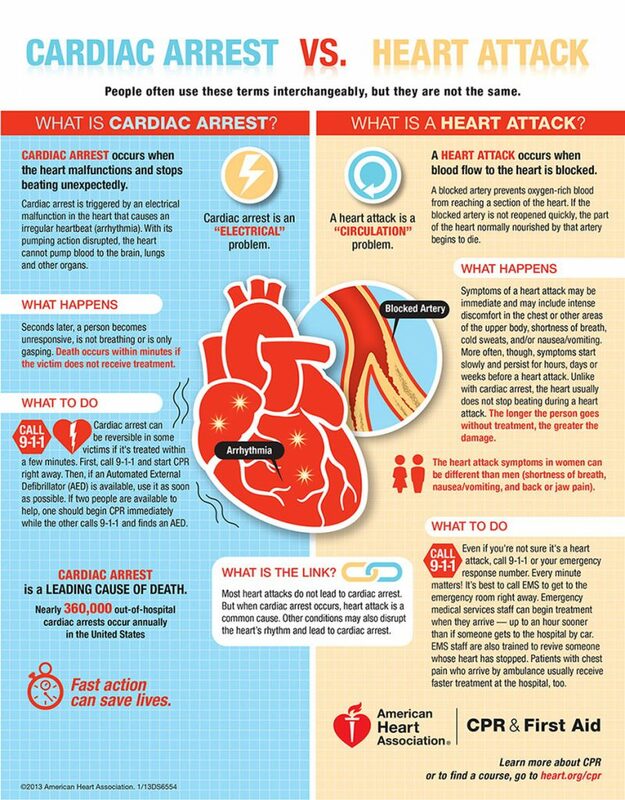 Sudden Cardiac Arrest and Heart Attack are NOT the Same Thing! Image Credit: ©2017 American Heart Association, Inc.
A heart attack occurs when a blocked artery keeps oxygen-rich blood from reaching a section of the heart. If the blocked artery is not reopened quickly, the part of the heart normally nourished by that artery begins to die. The longer a person goes without treatment, the greater the damage. Symptoms of a heart attack may be immediate and intense. More often, though, symptoms start slowly and persist for hours, days or even weeks before the heart attack. The heart usually does not stop beating during a heart attack. Symptoms can differ in men and women. Sudden cardiac arrest often occurs without warning. It’s triggered by an electrical malfunction in the heart that causes an irregular heartbeat (arrhythmia). With its pumping action disrupted, the heart cannot send blood to the brain, lungs and other organs. Seconds later, a person loses consciousness and has no pulse. Death occurs within minutes if the victim does not receive treatment. What is the link between the two? These two distinct heart conditions are linked. Sudden cardiac arrest can occur after a heart attack or during recovery. Heart attacks increase the risk for sudden cardiac arrest. Most heart attacks do not lead to sudden cardiac arrest but when sudden cardiac arrest occurs, heart attack is a common cause. Other heart conditions may also disrupt the heart’s rhythm and lead to sudden cardiac arrest. These include a thickened heart muscle (cardiomyopathy), heart failure, and arrhythmias, particularly ventricular fibrillation and long QT syndrome. Even if you’re not sure it’s a heart attack, don’t wait more than five minutes to call 9-1-1 or other emergency response number. Every minute matters. It’s best to call EMS to get to the emergency room right away. Emergency medical services staff can begin treatment when they arrive—up to an hour sooner than if someone gets to the hospital by car. EMS staff are also trained to revive someone whose heart has stopped. Patients with chest pain who arrive by ambulance may get faster treatment at the hospital, too. Cardiac arrest is reversible in most victims if it’s treated within a few minutes. First, call 9-1-1 for emergency medical services. Then use an automated external defibrillator (AED) if one is available. Begin CPR immediately and continue until professional emergency medical services arrive. If two people are available to help, one should begin CPR immediately while the other calls 9-1-1 and finds an AED. Sudden cardiac arrest is a leading cause of death—nearly 360,000 out-of-hospital cardiac arrests occur annually in the United States. By performing immediate CPR, you can double or even triple a victim’s chance of survival. Fast action can save lives. It’s a good idea to know what to do if someone experiences a heart attack or cardiac arrest. 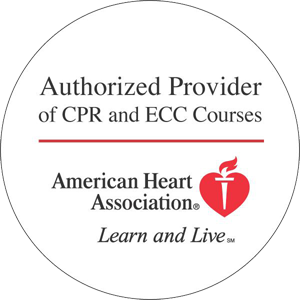 HeartCert offers CPR and First Aid classes for all skill sets and levels of experience. Whether you are an experienced Healthcare Professional or a new parent just wanting to learn ‘the basics’, we have a class for you! We can teach a convenient one-on-one CPR or first aid training session, or we can certify a large group on-site depending on your needs. Visit our Home page to get started. Source: ©2017 American Heart Association, Inc.